It is very easy to add a new flashcard. Learning to associate a letter with its most common sound is fundamental to learning phonics for reading. 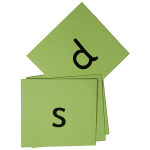 Sound Foundations Phonics Flashcards are a quick and easy way to teach the sounds taking just a couple of minutes once or twice a day. 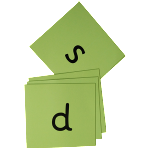 Our flashcards are free to download. Choose a new card to introduce. Take the cards out of the back pocket of your book. These are the cards your pupil does not know yet. Pick out the card with the lowest number. The cards are numbered in the order they are introduced in the book so it is important to teach them in that order. Select three cards from the front pocket, cards your pupil has already learned. Do not use cards you pupil is still unsure of. Do not use a card that looks like the new one—do not use d if you are teaching b. Do not use a card that sounds like the new one—do not use s if you are teaching z. 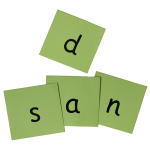 As an example, imagine you are introducing d and have picked out s, a and n as well known sounds. Work with these four cards. 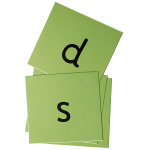 Hold up the new card and tell your pupil the sound—d, make sure he repeats it correctly. Slip the new card one card back. Most pupils will be able to remember the new card when it comes up again. Show him the next card—s, he says the sound, put it to the back of the pack. Now d, the new card, is back on top, show it to the pupil. If he cannot remember or gets it wrong, correct him and get him to repeat the right sound. Slip d in one card back. Show him the next card—a, he says the sound, put it to the back of the pack. Repeat this a couple of times. Next the new card slipped in two cards back. Your pupil has to remember d for a little bit longer. The old cards—s, a and n still go to the back each time. Repeat this a few times. It is no big deal if he gets it wrong, just model the correct response and put the new card one back. Finally put the new card at the back of the pack and go through the cards a couple of times more. That is all there is to it. The new card can now be added to the front pocket of your book. Do not worry if your pupil forgets it the next time you go through the cards, just correct and slip the card one back. 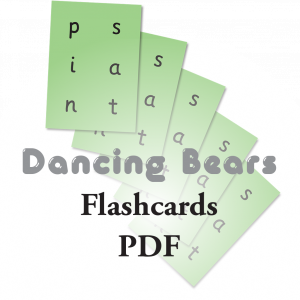 Sound Foundations Phonics Flashcards are included with Bearing Away, Bear Necessities A1, Dancing Bears A and Fast Track. They are also free to download.